I've been crocheting non-stop lately. I'm supposed to be building up my stock for a craft fair next month, but I've gotten a lot of special orders and since those are guaranteed sales, I move them to the front of the line. Most of the time special orders start out as a challenge. Someone sees something I've made and ask, "Hey, can you make ___ too?" Sometimes I give a cagey answer, like "maybe" or "if I can find a pattern, I'll have to look into it." I've had too many instances of people asking me if I can make something and then when I finish it and show it to them they don't express interest in buying it, and that drives me crazy, so unless they state that they'll be willing to pay for it when they make the inquiry, I don't usually bother crafting it (though I may send them links to patterns to give them an idea that I can do it if they are so inclined). A lot of times if I make one for that person and then post the picture on my Critters Facebook Page other people will ask me if they can order one too. That happened with my dinosaurs. I have made six so far for orders after the one initial order. I've also made a few hats, which aren't part of my usual repertoire (I was planning on selling only critters, scarves, and Christmas stockings at my craft fair table, any more and I think it will be too crowded. 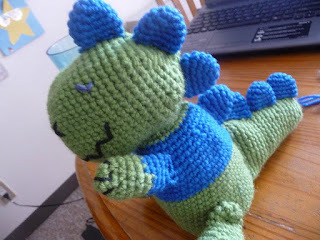 ), but I have gotten orders for a "Hello Kitty" and a "Boots from Dora" hat. . .and my next project is a dinosaur hat, though I'm taking a break to make Coryn her own dinosaur. I've made a ton of toys specifically for Coryn, but I know she doesn't like seeing me make something cool that she really wants only to sell it to one of her friend's mothers. She's watched me make the dinosaurs for the orders, and now she wants one of her own and I'm finally taking some time off from commercial orders to make it. She wants it to be purple. I just hope it doesn't look too much like Barney. I have an etsy shop but so far I've only used it to sell special orders to people I know who live too far away to hand me cash. I posted some items there, but their time on Etsy expired without any sells. It's the sort of thing no one goes looking for, but when they see them they generally want one, which works well for me at craft fairs.